MYSTIC KABALISTIC JEWISH PRIESTS ISSUE WARNING THAT THE APPEARANCE OF THE JEWISH MESSIAH IS IMMINENT! Title: MYSTIC KABALISTIC JEWISH PRIESTS ISSUE WARNING THAT THE APPEARANCE OF THE JEWISH MESSIAH IS IMMINENT! Subtitle: As so many other End Times prophecies are swirling to fulfillment, Kabalistic Jews are now proclaiming that the appearance of their Christ is extremely close. The Jewish people are being set up for their ultimate deception: accepting Antichrist as their Messiah! Prophecies are being fulfilled right in front of your eyes, in the Daily News! "As Hassidic Rabbis traverse the Holy Land publicly proclaiming the imminent arrival of King Messiah many onlookers wonder what the fuss is all about. These Rabbis explain in their excited manner that the Persian Gulf War was described in precise detail in Sacred Jewish texts as being the event which occurs as the identity of Judaism's King Messiah is revealed. Additionally they explain that the impact of the Shoemaker- Levy 9 asteroid into Jupiter in 1994 was also foretold in the Kaballa, Judaism's Sacred Book of Mysticism, as the heavenly sign of King Messiah's imminent arrival." These Hassidic Rabbis, also known as Lubavitchers, are followers of the ancient Mystic Jewish Oral Tradition known today as the Kabala [Spelled Cabala when it was "Christianized" during the Renaissance Period]. Before we go any further into this most exciting discussion, we need to stop to discuss what the Kabala is and why it is so very important to the appearance of Antichrist. The Kabala is the keystone of all Western occult thought and practice today, and is the cornerstone of belief for all Illumined Ones [Masters of the Illuminati] throughout the world. Whether an occultist is White Magic or Black Magick, their cornerstone of belief and thought is the Kabala. When Antichrist arises, he shall be basing his practice of the occult on the Jewish Kabala. Thus, the irony is that, when Antichrist strides out of the newly-built Jewish Temple after committing the "Abomination of Desolation" and begins his effort to slaughter every Jew on earth, the Jewish Kabala will have provided the major impetus for his efforts! Indeed, the Kabala formed the cornerstone of Adolf Hitler's occult beliefs, so this terrible irony will strike the Jewish people twice in world history. The Kabala began amongst Jewish priests who were corrupted by the Babylonian Satanic Mysteries while they were serving in Babylon during the 70-year Babylonian Captivity decreed by God as punishment for Israel's repeated sins. This Babylonian captivity is reported in the book of Daniel; it began in 606 B.C. and concluded in 536 B.C., when Persian King Cryus issued his decree to rebuild Jerusalem and the Temple. Thus, God's prediction to Jeremiah that He would punish Israel for 70 years for her sins [Jeremiah 25:11-12 came true precisely on schedule! During this time of captivity, apostate Jewish priests became infatuated with the Babylonian Satanic Mysteries, and began a process of converting the key beliefs into Judaism. When fully developed, this Oral Tradition "mystically re-interpreted" the Jewish Pentateuch [Genesis, Exodus, Leviticus, Numbers, and Deuteronomy]. This mystical re-interpretation was nothing more, nor less, than Satan's work in twisting the entire meaning and purpose of God's original Word in these five books. However, this mystical re-interpretation was Oral Teaching, or Oral Tradition, as Satanic teaching usually is, since they do not want any written literature to fall into the hands of the wrong people. Then, as these apostate priests slowly began taking over the entire Jewish priesthood, they went beyond mystically re-interpreting the first five books of the Hebrew Scriptures [called Old Testament by Christians]; they began to issue edicts that became known as the Traditions of the Elders. Jesus railed continuously against the Traditions of the Elders, calling them false and hypocritical [Mark 7:6], saying they contradicted the Word of God [Mark 7:9]. Peter called this Tradition "vain" in 1 Peter 1:18. Why was Jesus so unforgiving and harsh toward the Pharisees and Sadducees, when He was so tender and forgiving toward the most vile of sinners? Further, how is it that the Pharisees and Sadducees could look upon Jesus' unprecedented miracles and ascribe them to Beelzebub, the Prince of Demons, and not to God? The answer is both shocking and revealing: the Pharisees and Sadducees were not traditional Jewish priests, but were mystic priests secretly practicing the Oral Tradition they called the Torah, which about 1300 A.D. circa, became codified and known as the Kabalah. Thus, Kaballists -- Secret Society practitioners -- killed Jesus Christ! We reported this in 1992, and have preserved it in a 3-tape series entitled, Secret Societies Killed Jesus Christ. You will find this little known historic fact both exciting and enlightening as to the current situation. The fact is, the Pharisees and Sadducees knew the Old Testament thoroughly, including all the prophecies of Messiah; however, they had "mystically re-interpreted" every single verse . When Jesus came claiming to be Messiah and proving it by His miracles, the Pharisees and Sadducees knew He was truly the Messiah, but Jesus refused to become one of them! Jesus refused to keep the people spiritually blind as He opened the Scriptures to them, giving them the keys of understanding the Pharisees had deliberately hidden from them. [Matthew 23:13] They killed Him because they wanted to wait until one of their own appeared. And, he may be about to appear! Therefore, today's Kabalist Jewish Priests, now known as Hassidic or as Lubavitchers, are running around Israel proclaiming that their Mystic type of Christ [Messiah] is about to appear! Jesus prophesied this was going to be the case at the End of the Age when He said, "I am come in my Father's name, and ye receive me not: if another shall come in his own name, him ye will receive." [John 5:43] This Messiah Christ who will come in his own name only, but he will be received by the Jewish priesthood and people; however, he is none other than Antichrist. He is the one these Kabalist priests are saying is about to appear! In the Satanic tradition, the Antichrist False Messiah must go through a death, burial, and resurrection! This sequence of events is ritually represented by the initiate as they "die to self", and then lay themselves into a coffin [death], only to be "resurrected" by the Master Mason utilizing the "grip of the Lion's Paw"! This Masonic ritual is repeated throughout all of the occult, no matter of what stripe or flavor. In fact, every Satanic ritual required to be a Grand Master requires a Death/Burial/Resurrection within the ritual. Thus, the coming Antichrist must have gone through this Death and Burial phase so that his appearance on the earth will be seen by his followers as the "Resurrection" phase of this Death/Burial/Resurrection scenario! With this fact in mind, let us now return to our feature article. "In 1991 Hassidic Rabbis of the Chabad Lubavitch sect issued an historic Jewish Religious Ruling. It states unconditionally that Rabbi Menachem Mendel Schneerson is assuredly [Judaism's and mankind's] King Messiah ... Rabbi Menachem Mendel Schneerson, identified himself as Judaism's Final Redeemer during numerous public religious discourses in 1990-92. 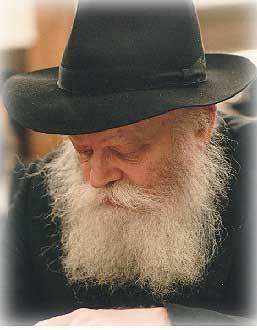 Rabbi Schneerson passed away in 1994. His passing, however, has not deterred these Rabbis from continuing to make their challenging proclamations. Kaballistic sources teach that Judaism's King Messiah will be revealed, become known to but a few amongst the world, and will later reappear to complete his tasks after his perceived passing." That is the occult Death/Burial/Resurrection doctrine that Antichrist will be seen as fulfilling! Thus, the scene may very well be set that Rabbi Schneerson may very well appear to have been resurrected when Antichrist stages his initial appearance. However, if he looks like Rabbi Schneerson in the photo above, the Hassidic Kabalistic Jews will be ecstatic, but no one else in the world will care. Antichrist needs to be a good-looking dynamic individual if he is to capture the attention and worship of the entire world. Lambert began this part of the discussion about the coming New Age Christ, whom we will know to be Antichrist. Lambert first said that his appearance will be immediately preceded by a sound that will powerfully reach all peoples of the world on three distinct levels: spiritual, physical, and emotional. "When Lord Maitreya appears, he will appear as different beings to different people. He will appear as a man to a man and as a woman to a woman. He will appear as a white to a white, as a black to a black, as an Indian to an Indian, etc. It makes no difference whether you are viewing him in person or on Television. Thus, he will show that he is 'all things to all people'." Thus, I wonder if Hassidic Kabalistic Jews -- and maybe the average Jew also -- will actually see a "resurrected" Rabbi Schneerson? It is extremely possible, since such a phenomenon would work to guarantee the depths of extreme deception the Jewish people will suffer under Antichrist. While the Jews may be seeing Rabbi Schneerson "resurrected", the rest of the world will see Antichrist according to the scenario Lambert laid out, above. Can you imagine such a thing? A black couple will see Antichrist as black; however, the black husband will see him as a man, while the black woman will see him as a black woman. The same occurrence will happen worldwide, to every member of every race! Now, remember our earlier discussion that the Antichrist must be seen as following the Satanic doctrine of Death/Burial/Resurrection ? As we read further into the web site of these Lubavitcher Jews, we were shocked when we read their explanation as to how Rabbie Schneerson -- who died in 1994 -- could still be the prophesied Messiah. This teaching is the Satanic concept of Death/Burial/Resurrection! Obviously, Rabbi Schneerson was "revealed" during his lifetime as he was proclaimed by his followers as the Messiah, right up to the time of his death. Then, he was buried [concealed]. Now, when he apparently rises again claiming to be Messiah, he will be seen as "revealed" again. A subscriber who listened to this show all the way through said that the Lubivitcher Hassidic Rabbi being interviewed -- Rabbi Moshe Yess -- announced that he had been authorized to appear on this Art Bell show to make this global announcement: The Jewish Messiah is ready to make his appearance. The Hassidic group expects him "any second". As I have stated in previous articles, the occult world is in a state of twitter, as they expect Maitreya the Christ any second. * Matthew 24:6 -- "Wars and rumors of wars" -- not a day goes by without rumors of wars emanating from the Middle East. Israel is about to go to war with the Palestinians; once Arafat sees the overwhelming Jewish military force coming against his outmanned and outgunned forces, he will order the blowing up of the Muslim Dome of the Rock [Al Aqsa], blaming it on the Jews. [Read NEWS1404 for full details] He knows the Muslim world will become inflamed against Israel, forcing Syria, Egypt, Jordan, and Iraq into war against Israel, in a united regional Jihad [Holy War]. We consistently hear of Russian military plans to enter the Middle East, and we know prophetically she will do exactly that [Ezekiel 38-39]. For the first time in her history , Russia has the military capability to successfully project her armed might across her borders. We are consistently hearing of Arab plans to wage terrorist war against the United States as we move to vigorously defend Israel. * "For nation shall rise against nation, and kingdom against kingdom ..." [24:7] Throughout the world, in the past 50 years and continuing today, we see many such instances of smaller nations rising against other smaller nations in conventional war and guerilla war. Thus, Africa is racked with such war, as is the Philippines, as are several nations in Southeast Asia. * Famines and earthquakes in many places -- [24:7]. The world is consistently seeing famines in various parts of the world, and earthquakes are rattling throughout the globe in nearly a daily manner. * The falling away of those who did trust Jesus Christ [24:10] and 2 Thessalonians 2: Truly, the Apostasy of the Christian Church is reaching nigh unto Hell, thus opening the door to Antichrist. We have reached the point now in the Ecumenical Movement where a genuine Christian must not trust in any human being, but must be like a Berean who searched the Scriptures to see if what they are hearing is Biblical. * False prophets [24:11] -- Truly, false religions abound today like never before, commanding huge numbers of followers. Unfortunately, those Liberal Christian Churches who have gone into Apostasy now swell the ranks of the false religious prophets. Christians who do not know their Bible doctrines well are the victims of this type of religious deception. * The love of the great body of people will grow cold toward Jesus Christ [24:12] -- Today, the numbers of people in a true, Fundamental Christian Church grows increasingly small. Most of the mega-churches of today are filled with counterfeit Christians who want their ears tickled by the latest in human psychology and church growth doctrines, and who rebel against sermons on Hell and Judgment. * Gospel will be preached throughout the whole world [24:14] -- The outreach of Cutting Edge Ministries using the Internet, plus a myriad of other Fundamental ministries doing the same, has exploded the Gospel of Jesus Christ throughout the entire world. Christian radio is accomplishing the very same thing. Today, even the furthermost reaches of the world are hearing the Gospel. Until the advent of the Radio and the Internet, this Scripture seemed not ready to be fulfilled. Thus, it does seem that Antichrist is primed to appear. If this is the case, remember a few Biblical facts. 1. The first "Christ" to appear after the birth of Israel as a nation [May 15, 1948] will be the mystical, counterfeit Christ the Bible calls Antichrist. 2. Whereas, Jesus Christ will appear at the end of the Great Wars of the Book of Revelation, culminating with the Battle of Armageddon, Antichrist will appear after the great planned wars prophesied in Matthew 24. The Russian invasion of Israel possibly being the last war [Ezekiel 39:9 -- seven years] before Antichrist arises. 4. Whereas, Jesus Christ will initiate his Thousand Year Reign of Peace and Safety [Revelation 20:4], Antichrist will promise to establish a 1,000-year reign of Peace and Safety. In every way possible, Antichrist will simply be a counterfeit Jesus Christ. But, you who know God's Word, and His prophecies, will not be deceived. We have Jesus' firm promise to that effect [Matthew 24:24]. Maybe the Guiding Spirits of these Kabalistic Jewish priests are telling the truth; maybe Antichrist is about to appear. All the other signs seem pointing toward this event. Are you spiritually ready? Is your family? Are you adequately protecting your loved ones? This is the reason for this ministry, to enable you to first understand the peril facing you, and then help you develop strategies to warn and protect your loved ones. Once you have been thoroughly trained, you can also use your knowledge as a means to open the door of discussion with an unsaved person. I have been able to use it many times, and have seen people come to Jesus Christ as a result. These perilous times are also a time when we can reach many souls for Jesus Christ, making an eternal difference.